Last year, there was a trio of Victorian beers born of similar inspiration that caught the eye. They were blended sours from Holgate (Wild Red Ale), Boatrocker (L.A.B.) and 3 Ravens (Wild Ravens Old Brown Ale). The last of these was also the first of a trio, all of which would feature a portion of various old beers they'd kept around the brewery and which would undergo various maturation and fermentation processes before being bottled (where further re-fermentation will continue). 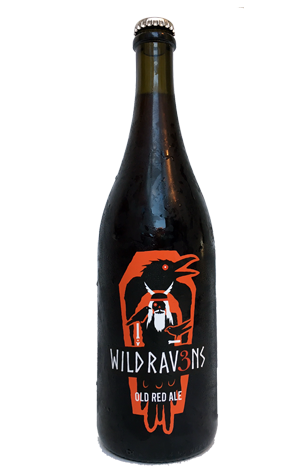 The last of the Wild Ravens trio (hopefully, just the last of round one) is the Old Red Ale, one which the brewers reckon is the best of the three – a big call when the Old Brown made it onto our long list for Best New Victorian Beers of 2016 (in which Ravens was represented instead by their American Double IPA). It's inspired by Flemish red ales and started out as two wine barrels (that previously housed Druid Belgian strong ale) and a keg's worth of what was intended to be the finished beer. When the barrels refused to develop enough acetic character (the defining, balsamic vinegar like character of beers such as Rodenbach), the brewers decide to blend in a barrel of a golden sour that was heading in that direction, which got them where they wanted to be. Considering the lengths they went to to get there – various fermentation and maturation techniques including kettle souring, abbreviated fermentation, maturation with bacteria and wild yeast and blending of young and old ales – the end product is remarkably streamlined. You know it's going to have a fulsome body from the moment you notice the bubbles in the glass aren't so much rising to the top as swimming through the beer, yet the acidity balances that out. And, indeed, balance is where it's at. Sure, you'll find sweetness (presumably from a combination of dark malts, age, booze and acetic acid), plus a souring, cleansing acidity, dark fruit, oak and a tannic dryness, but mainly you'll find a rewarding beer that you'll want to savour.